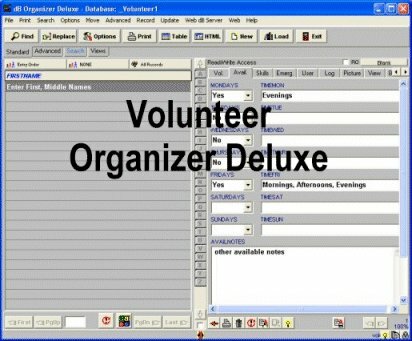 Volunteer Organizer Deluxe for Windows: simple database management software that helps you to organize, track, and manage your volunteers. Enter, view, and modify volunteer data. Send email messages to all or selected volunteers. Print letters. Print volunteer id cards, labels. Search filter your volunteer data by any field. Unlimited number of records. For the database novice, volunteer management intuitive interface and ready-to-use database management solutions make it easy to set up and use. For the power user, Organizer affords the simplicity of wizards that make it easy to set up and use teacher management solutions that you create. You can modify databases included in the system. rds, labels. Search filter your volunteer data by any field. Unlimited number of records.